I had no idea that today was International Vulture Awareness Day until yesterday, when posts and tweets started cropping up. To be honest, I had no idea it existed at all. But I thought, why not? These poor maligned creatures need some love, and I'm happy to join in the chorus of people who want to raise the profile of this unique group of birds, which contains several species around the world. I've always been rather fond of them, and I'm glad to note that there's an entire community of people out there who are just as if not more fond of them than I.
Vultures are possibly so maligned because they eat carrion, and are therefore reviled with the same strength that other carrion eaters (ie. crows) tend to be. But that's ridiculous. If we didn't have vultures we'd be up to our necks in rotting roadkill, and I, for one, am grateful that someone will eat that stuff. They're an integral part of the world's ecosystems and they are often completely overlooked if not outright discriminated against. The major issue that is being raised by IVAD today is the plight of vultures in Asia, which are being poisoned by the vetrinary drug Diclofenac, which is used to treat cattle -- if the cattle die in the fields, the vultures eat them (as they are wont to do) but the drug builds up in the vulture's system and eventually causes death. Here in Canada we have one regularly occurring species, the turkey vulture. We also occasionally get black vultures popping up as far north as Point Pelee, or Toronto -- but that's a rarity and excuse for celebration and frantic scrabbling among Ontarian twitchers. We're lucky (and the vultures are lucky) because turkey vultures are doing quite well here, even expanding their range further into Canada. Turkey vultures were one of the very first birds that I was able to reliably recognize, and so even if I didn't think they were cool, I would love them just for that. I also find them to be one of the easier birds to help kids identify. Turkey vultures make a "v" with their wings when they're soaring: "v" for vulture. Big and black, hardly ever flapping, with silvery primaries and a bald red head. A lot of people think they're ugly, but I think they have a wonderful if unique beauty about them. Their little nekkid heads with their big eyes are quite compelling. I'm told, by people who will know, that turkey vultures are one of the brighter species of large birds and we can tell this because they are social creatures. They like to hang out with other vultures. One of the coolest things I've ever seen was a group of turkey vultures hiding from a rainstorm underneath the awning of a little hydro building out in the middle of a field. They were all hunched over, and clearly vying for the best and driest spots. I'm also told that turkey vultures are exceedingly tidy birds, very vain, constantly preening. Which is counterintuitive for a lot of people, given the vulture's diet. I'd love to meet a turkey vulture some day. We've attempted to see them closer once, by throwing a raw hamburger on the lawn at the cottage just to see if the vultures circling over would come down to investigate. I think the hamburger was too fresh, though, although it had gone off by our standards. Or perhaps there wasn't enough hamburger. Vultures are big birds. Um. So, yes. There's your weird fact about me for the day: I tried unsuccessfully to set up a vulture feeder. 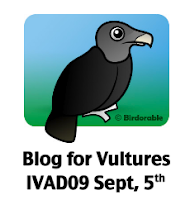 Spread the vulture love, everyone, and happy International Vulture Awareness Day! Posted by Unknown at 7:38 a.m.
September 5, 2009 at 8:30 a.m. I'm glad you enjoyed! Thanks for dropping by. September 5, 2009 at 8:47 a.m.
Imagined you sitting in your garden closely observing a rotten Hamburger..lol. September 5, 2009 at 10:35 a.m. I am afraid that I am not a fan of turkey vultures, as they nearly killed me last fall. They were eating roadkill around the curve in the road, and when I showed up they all took off--straight into my windshield! Terrifying! September 5, 2009 at 2:50 p.m.
September 6, 2009 at 2:37 p.m.
Ok, I had to laugh at your feeder attempt. I did the same thing years ago. Didn't work for me either. What you need is roadkill or something really dead. And some place to put it really far from the house or else the smell would be enough to choke on. September 12, 2009 at 11:20 a.m. Excellent. I shall be on the lookout! But only if I have time to take it up to the cottage, because I'm pretty sure my city neighbours wouldn't appreciate my vulture feeder. September 12, 2009 at 11:51 a.m.